The 5th Chancellor of Abia State University (ABSU), Prof James Ayatse has said that he will deploy his wealth experience and network built over the years to impact positively on the fortunes of the university. 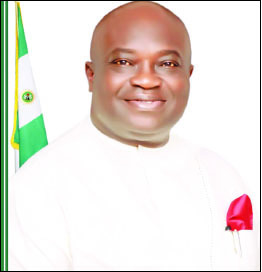 He spoke at the 26th convocation ceremony of ABSU, expressing gratitude to the Abia state Governor, Dr. Okezie Ikpeazu for appointing him the 5th chancellor of the university. Ayatse also said that his appointment has the potential of strengthening the relationship between Abia and Benue State, where he comes from. Earlier, the governor lauded the VC, management and deans of faculties of ABSU for running a smooth academic calendar for the past four years. “This is not a mean feat and I take this opportunity to congratulate the VC, management and deans of faculties of this great institution”, Ikpeazu said. He equally thanked the students for showing understanding by helping to maintain the ambience that has allowed the university to grow and flourish. “ I count myself as a very fulfilled person because four years ago when the students enrolled to graduate four years after, we were not sure if it was going to happen because of the vagaries that have become the lot of academic effort in Nigeria. “But to God be the glory today that in ABSU, if you enrol to study a four years course, the only thing you need is to be committed and diligent in your study and assuringly, four years after you will graduate,” he stated. He charged the graduating students to uphold the character they were taught in the university, noting that those with good character are today scarce. “As you graduate, you are armed with two things, learning and character. Of the two, one has become scarcer. And that which has become more scarce is the one you must hold on to,” he advised them. Speaking also, the Pro-Chancelor and chairman of the Governing Council, Senator Adolphus Wabara stated that the council is committed to ensuring that the university development does not lag behind. He described the new chancellor as a gift to the university with great wealth of experience. Earlier, the Vice Chancellor, Prof Uche Ikonne disclosed that ABSU graduated 4,117 from various disciplines. He announced automatic employment for the best overall graduating student, Miss Onyebuchi Chioma Precious from Department of Philosophy. Prof Ikonne charged the graduands to reflect and defend the motto of the university which is excellence and service.